This was another bespoke development for a major UKAS approved EMC test house. When susceptibility testing requires an RF source with characteristics like a radar transmitter, what you really need, is a radar transmitter! At Abex, we take pride in our broad range of electronics experience. 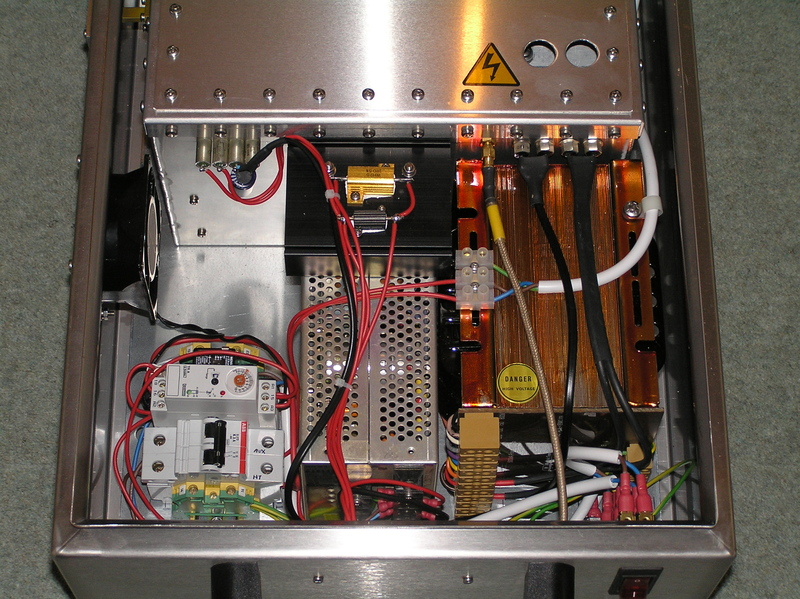 This project called on our know-how with RF, high voltage power supplies, pulse transformers and pulse forming networks, drive requirements of large IGBT's, saturable reactors, analogue control circuitry, fiber optics, and of course, magnetrons. The particular combination of technologies required by this project is relatively rare in small companies. Fortunately we did have prior experience gained at a major UK defence contractor in the mid 1980's. What we came up with was a scaleable design for the magnetron modulator, that could be used with magnetrons over the range approximately 10-150kW. The peak power delivered to the cathode circuit of a 100kW magnetron is of the order of 400kW, so this is definately NOT trivial! We completed the build of 4 systems and delivered them to the customer. They were optimised to the requirements of the 4 magnetrons used; in terms of the peak pulse voltage and current, pulse width and PRF, and of course the heater requirements. They have been in use for a number of years, and have demonstrated excellent reliability. The magnetron was invented in the 1920's, and refined for use in radar transmitters during the early part of WW2. The design has changed surprisingly little since then. They are in fact much more common in microwave ovens than in radar transmitters. However, there are differences, and the types used in microwave ovens will not produce the high peak power used for radar. It is interesting to note that the largest present day magnetrons produce well into the megawatt power range. 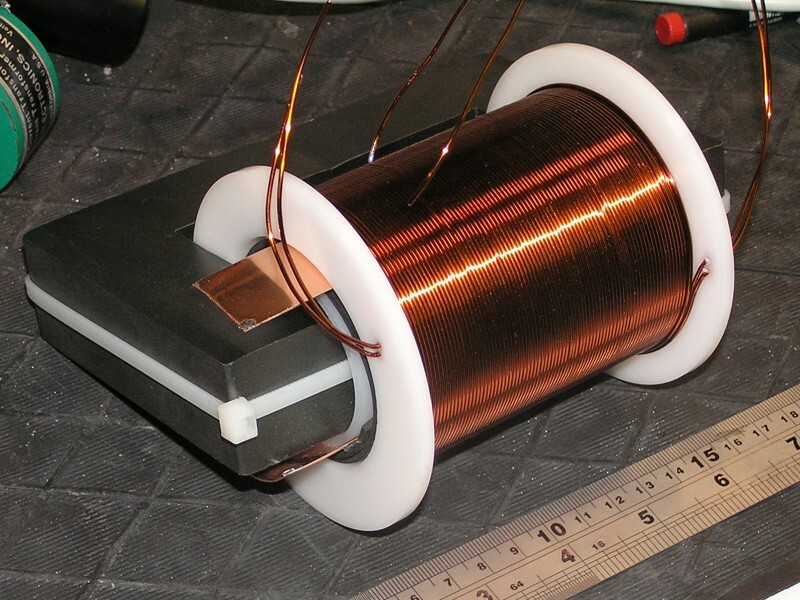 The largest magnetron used for this project was a 16GHz device, requiring 20kV and 20A (concurrently) cathode drive during the 1uS RF pulse, and producing a minimum 100kW of RF. 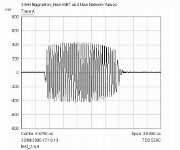 The RF waveform can be easily observed if first downconverted to a suitable IF frequency. The lower plot shows a 3GHz pulse downconverted to approximately 30MHz. The amplitude characteristic is plainly visible. 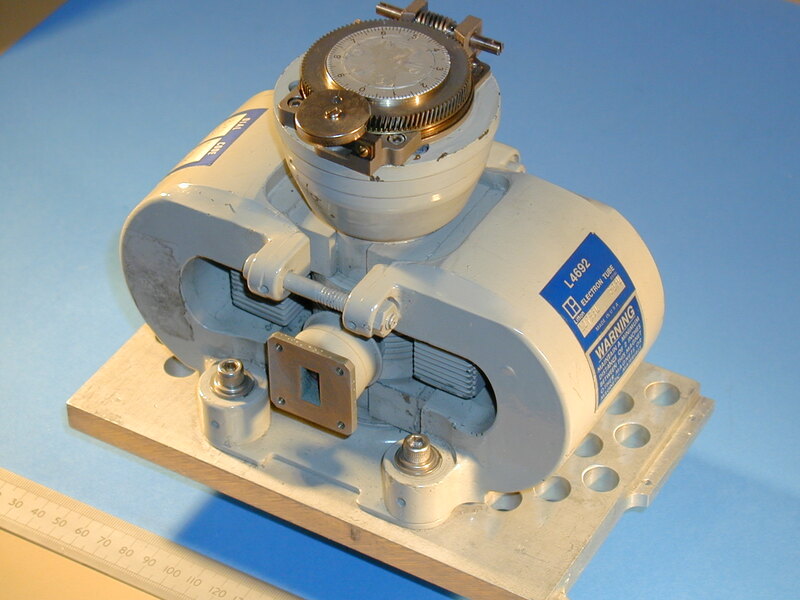 The magnetron, being a type of "thermionic valve", also has a heater associated with the cathode. 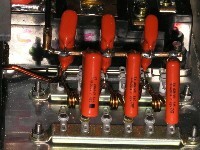 The heater requires (typically) 6.3V at 2A or more. The heater supply must be isolated from the 20kV cathode pulse, which can be achieved by either a high voltage isolation transformer, or as here, with a bifilar winding on the pulse transformer. An additional complication involves the bombardment of the cathode with secondary electrons. As the average power output of the magnetron is increased, this effect leads to an increase in the temperature of the cathode. This is a destructive effect and must be avoided. More about this below. The large pulse required to drive the cathode of the magnetron may be produced in a variety of different ways. 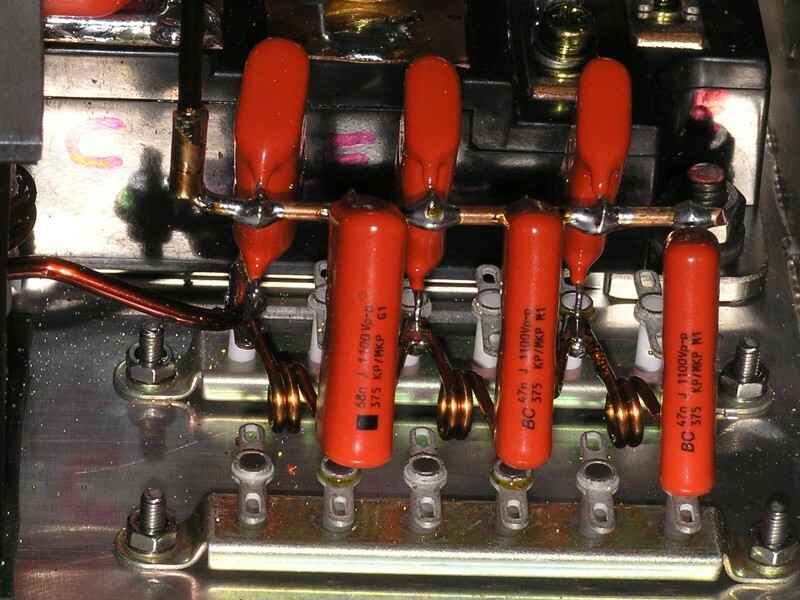 Historically, modulators based on Thyratron tubes were quite popular, as were designs based on hard vacuum tubes with large surface area oxide-coated cathodes. Later, semiconductors became an option, with some of the earliest solid-state designs being based on the Thyristor, a type of triggerable or "controlled" rectifier. 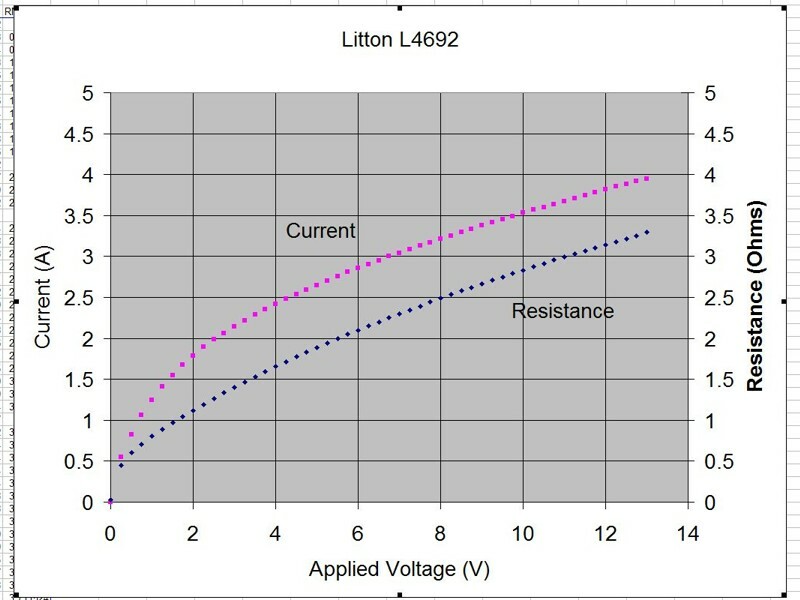 Present day semiconductors, especially the IGBT, gives us other options for a fully solid-state design. 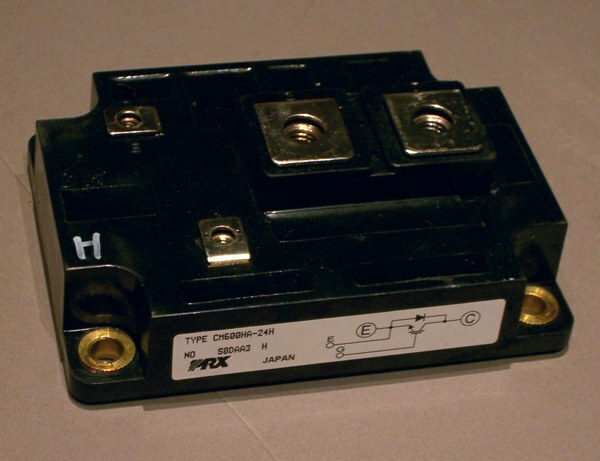 The IGBT offers the advantage of simple drive circuitry and robust operation. A single device is capable of switching at the megawatt power level. The switch utilsed for this project is a Powerex IGBT combined with a saturable reactor. The saturation characteristic of a magnetic core is usually considered to be an inconvenience. It can lead to power loss and distortion, and in the design of transformers the core and windings must be carefully chosen to avoid the onset of saturation. However, there is a class of component that makes use of the saturation characteristic in a very interesting way. This component is known as the saturable reactor. The IGBT switch discussed above can switch a very large amount of power, but the transition of the switch from "off" to "on" is rather slow. In the case of the IGBT used, the transition takes around 500nS. This is a significant proportion of the required pulse length (1uS), and results in two problems. Firstly, there would be a significant degradation in the fidelity of the pulse, i.e. it would be distorted. 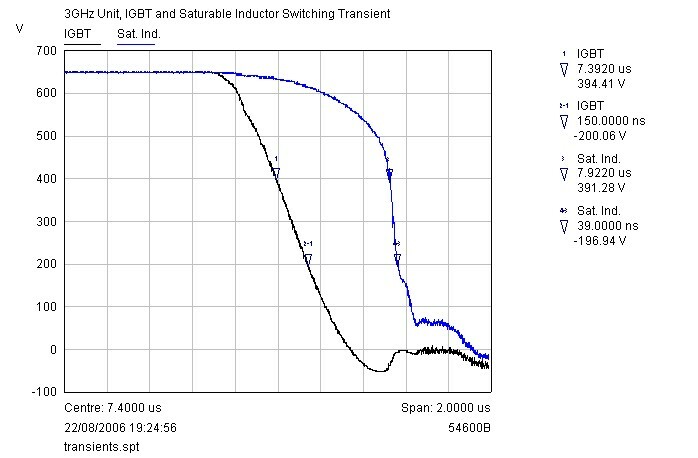 But secondly, the IGBT can be damaged by the transient power dissipation that occurs during the switching transition. A saturable reactor can be used to protect the IGBT from this transient by limiting the current that flows while switching occurs. But also, it has the effect of significantly accelerating the transition that is experienced downstream of the inductor. For this design, the switching time is seen to decrease from >500nS without it, to less than 100nS with it. Note, we are interested in that part of the transient where the magnetron begins to draw current; before this point the dissipation is minimal. The fidelity of the pulse is dramatically improved. The pulse forming network (PFN) is a lumped equivalent network that behaves as though it were a transmission line. If a real transmission line (e.g. a coax cable) is charged up to high voltage, we find that it stores energy due to it's distributed capacitance. If the "charged" line is then connected to a load, current flows from the line into the load, and keeps flowing until a reflection of the "load" returns from the far end of the line back to the load. In this way, a pulse of energy is delivered to the load which has a flat top and is exactly twice as "long" as the line. 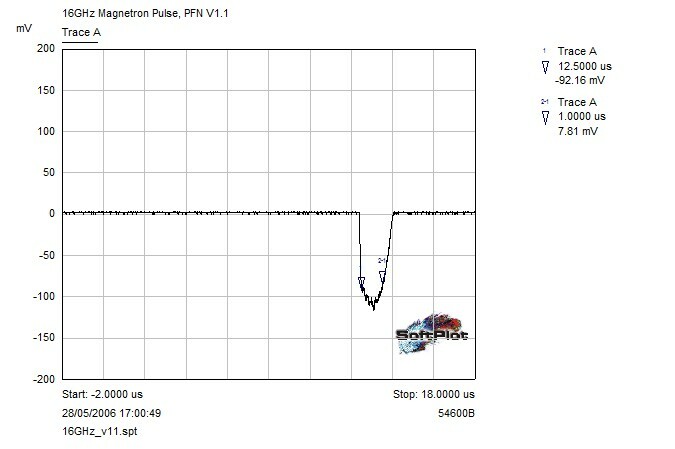 This is an entirely different result to the discharge of a capacitor, which would deliver an exponentially decay that is completely unsuitable for driving the magnetron. An important feature of the PFN is that it posesses a "characteristic impedance" exactly like a real transmission line does. This characteristic impedance plays a vital role in limiting the current that is available at the magnetron cathode. Indeed, if the magnetron were driven by any other means, it would be necessary to introduce a current limiting feature to protect the magnetron from damage. The PFN is modelled as, and constructed as, a number of series-L shunt-C sections. The values are selected to give the impedance and pulse length required. Due to the high voltage required by the magnetron, it is usually necessary to use a transformer. The largest magnetron in use for this project operates at a cathode drive of 20kV and 20A, and we require a pulse length of 1uS. 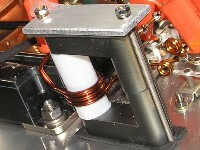 The transformer must be designed to deliver this at the secondary winding. It is also very convenient to supply the heater power via the output winding, and this can be accomplished if the winding is bifilar. The final transformer design utilises a pair of large ferrite "C" cores. The secondary winding is a single layer solenoid to avoid insulation issues between layers and to reduce it's self-capacitance. It is in fact a bifilar winding, which is wound in a concentric fashion rather than the more common side-by-side approach. This allows the use of larger wire and reduces losses, both for the cathode pulse, and also in the heater circuit. The primary winding is implemented using copper sheet which is the full width of the secondary winding. This maximises the magnetic "mesh" and hence reduces the leakage inductance to a minimum. 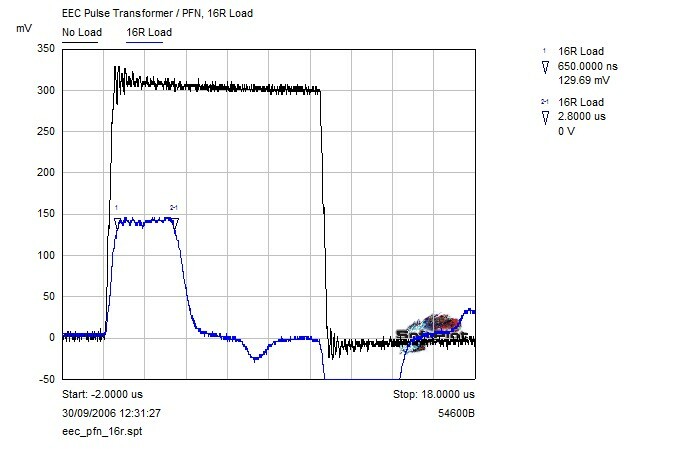 The resulting transformer is highly efficient. Once the windings are completed, multiple layers of mylar tape are added, and several layers of varnish. 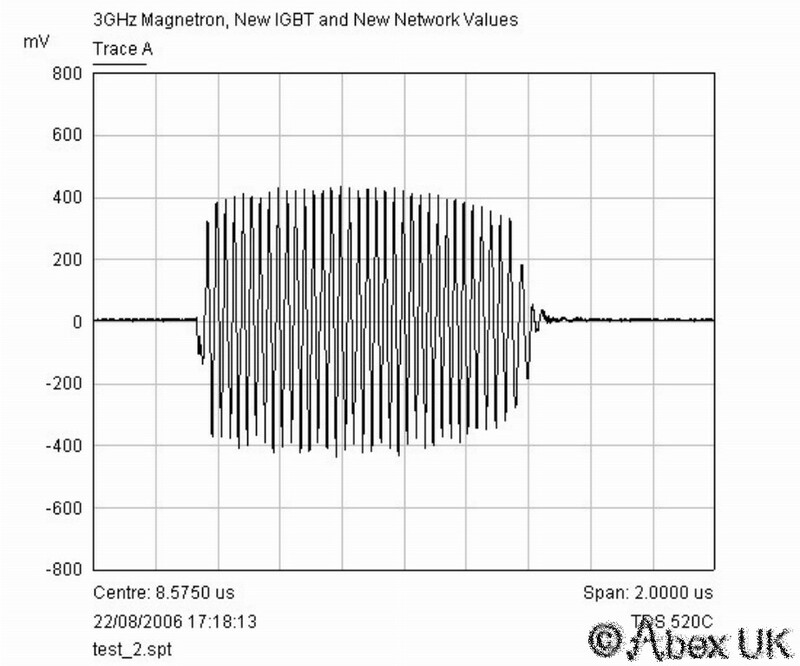 The lower image shows a 1uS 20A pulse, while driving the 16GHz magnetron to 100kW of RF output. The magnetron heater must be maintained at a constant temperature. In a radar transmitter using a fixed Pulse Repetition Frequency (PRF), there are usually two preset heater drive conditions. In the first, without RF, the heater is driven at it's rated voltage which may be, for example, 6.3V. In the second condition, with RF, the heater voltage is reduced to compensate for the heating effect of secondary electron bombardment. In some designs of magnetron, the limiting value of average output power is reached when the heater temperature is maintained at it's correct operating point wholly by the secondary electron bombardment, and without any heater current at all. Our customer required a fully variable PRF, requiring a completely different approach. It is a well-known characteristic of tungsten filaments, that as they heat up, the resistance increases. It is hence possible to measure the temperature of a filament by measuring it's resistance, and to use this measurement to control the drive current to the SAME filament. We devised and tested a control circuit to do exactly this. As the PRF is increased, the circuit automatically regulates the heater temperature by reducing the drive voltage. The feedback signal for this control loop is derived by measuring the heater resistance. The trigger signal is provided externally by a pulse generator. The pulses may be single, double, or triplets. They may be "random" if required. This characteristic is determined by the external pulse generator. To ensure reliable, noise free operation, the trigger pulses are delivered by fiber optic cable. A receiver interface is built into the control box, and connected via a suitable fiber to the transmitter unit, which is a custom made BNC adaptor with the fiber optic transmitter inside. A simple gating circuit utilises CMOS monostables to ensure that the pulses fall within the acceptable range of PRF values, and that accidental triggering by flourescent lighting is not possible. 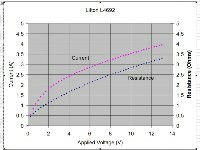 A variable D.C supply is required for PFN charging in the approximate range 400V - 800V. 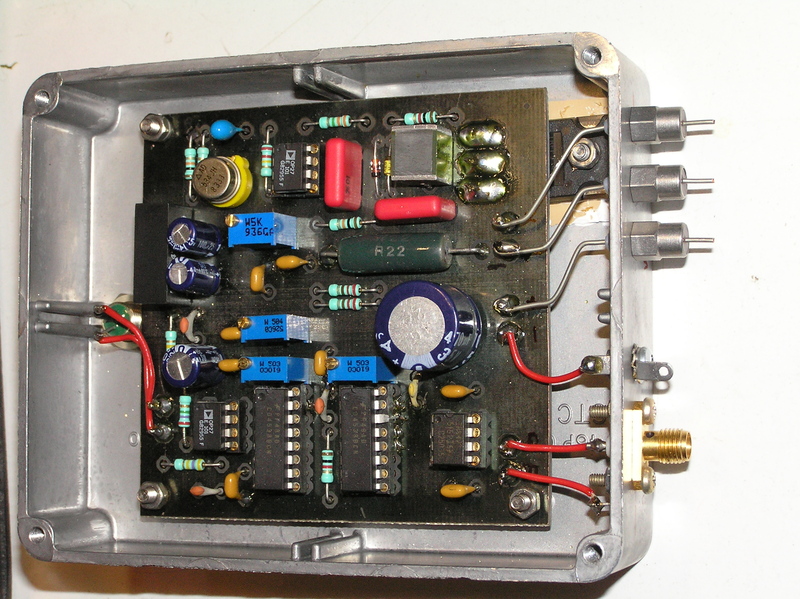 This is provided by an external variac, internal high voltage transformer, and a bridge rectifier with a bank of "adequately" sized smoothing capacitors. The capacitors are fitted with a slow "leak" resistance to discharge them over the course of a minute of so, but also with a high voltage relay and a much more agressive discharge path that will under normal circumstances achieve a charge dump in approximately 1s. Other supples required by the unit are provided by a 15V off-line power unit and DC-DC converters.